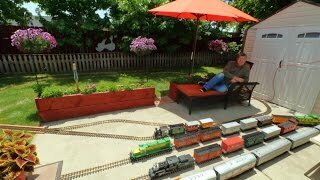 G-scale model trains are so big that it didn’t take long for me to run out of room in my house for them. So, the next logical step was to set them up outside! With plenty of room in my back yard, I was able to come up with a pretty nice layout for my trains… including a little switchyard on my patio. Even though this type of model train is designed to handle being outside, I like to keep mine in really good shape and don’t want to leave them exposed to the weather for very long. So, what you see in this video was set up in the morning and taken down at the end of the day. Setting it up and taking it down again in the same day was a lot of work for one day’s worth of fun. It may be a while before I do that again! The track-level video was shot with a DJI Osmo motion-stabilized video camera. All the rest was shot with a Canon EOS 80D.